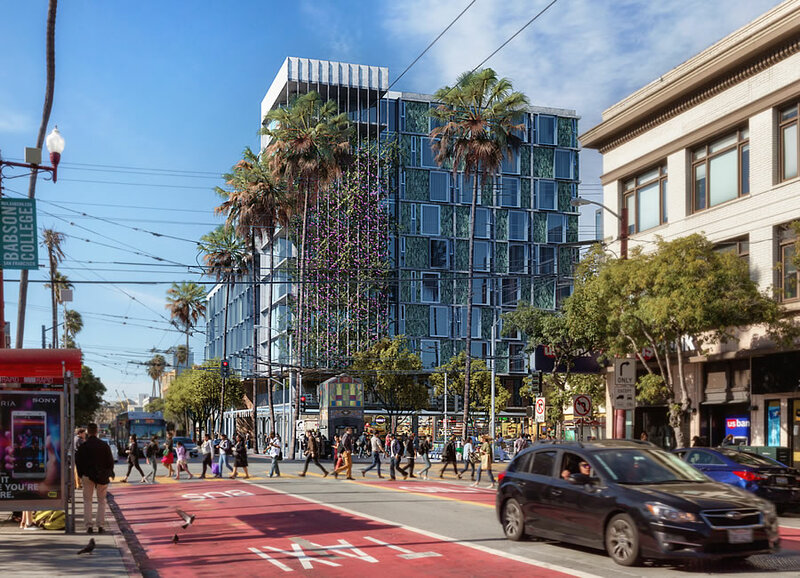 With San Francisco’s Planning Commission slated to hold a special hearing for the proposed 331-unit development to rise up to ten stories in height at 1979 Mission Street, the so-called “Monster,” in the Mission tonight, the development team is preparing to pitch a new deal for project as newly rendered below. 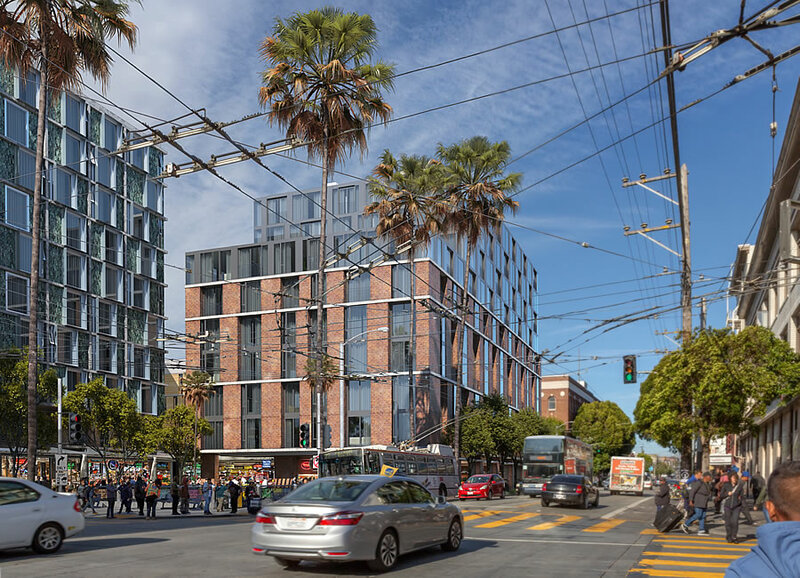 In exchange for entitling the 331-unit development, Maximus Real Estate Partners is proposing to dedicate two other development sites in the Mission for the City’s development of below market rate housing. The two parcels at 2675 Folsom Street and 2918 Mission Street, for which Maximus has self-reportedly inked tentative purchase agreements, are technically entitled for the development of up to 192 units of housing, a yield which could theoretically be bumped up to over 300 units if a local density bonus was approved. 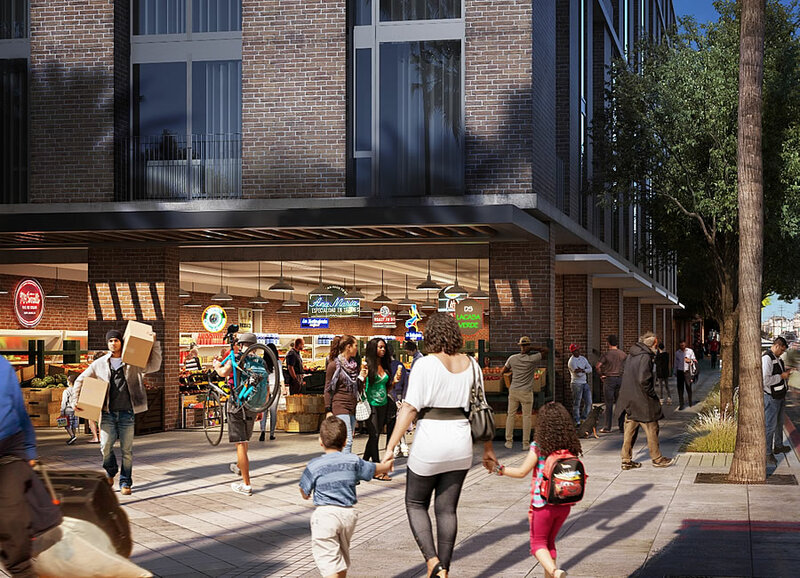 And if the deal is accepted and the proposed development is approved, all 331 apartments at 1979 Mission Street would then be leased at market rates, atop 32,000 square feet of new retail space, including a new “Mercado” of vendors fronting an expanded corner plaza. This a win-win-win. I hope sensible minds prevail and this latest deal gets consensus.Not holding my breath however. yay, 100% market rate at 16th please. Ronen’s position on this will be key. Will she cave, or lead from the front and take some heat? Hard to guess, but I hope it’s the latter. Not at all optimistic. I’m sure she’ll parrot the “100 ‘affordable'” demand of the opposition. Ronen knows nothing about economics and frankly, every idea that I hear coming out of her mouth makes no sense economically nor legislatively. Why don’t you post a summary of those proceedings here afterwards? It would benefit the readers of this site to know the politics and economics of how developments happen or do not happen in this neighborhood and city. Most of the posters here are long on aesthetics and short on a thorough understanding of finance and economics. As I understand the latest proposal, if 16th/Mission is approved, Maximus will purchase the other 2 sites (Paraque Ninos Unidos and the laundromat) to be deeded to the City to be developed as 100% BMR. The problem is that the MOHCD won’t likely have the funds to do so and they’ll lie “land-banked” for years. I’d rather see all 3 privately proceed individually each with the requisite BMR provided. Of course, in the current market, that would not necessarily assure they would each get built. 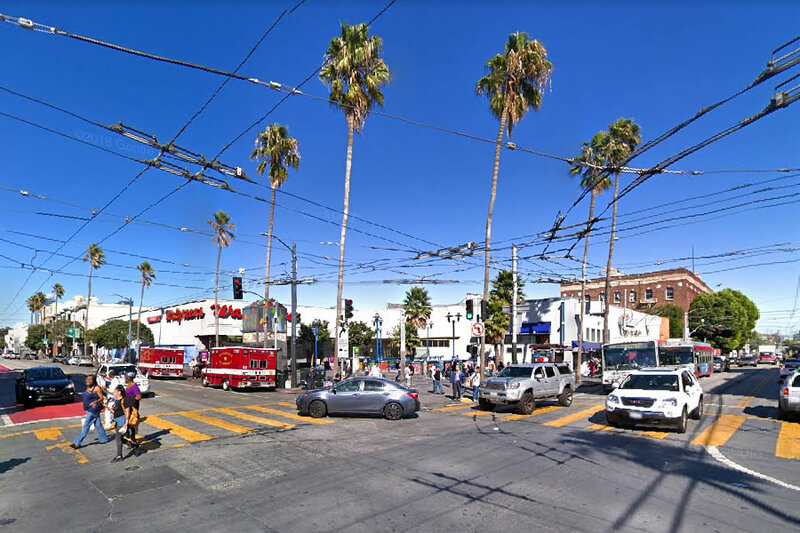 The Folsom Street property’s entitlement was already previously put up for sale with no takers and Mr. Stillman was expressing doubts about proceeding with the requirements imposed on Mission Street proposal. Serious question – How is building below market housing helpful to the overall housing shortage in San Francisco? Below market requirements ad costs to the market rate housing and benefits only the very few that qualify. Besides, I thought the era of building “the projects” was over. Whether there are 192 units or 300 built, shouldn’t the idea to be allow as much market based construction as the market will sustain?. I know zero about the economics of housing, but it seems to me that the better strategy would be to open up, the outer neighborhoods to more construction by up-gauging from predominantly being one, two three stories to four to eight stories of modern construction. To the folks who are upset at being priced out of The Mission and San Francisco, I say join the club. Most natives of the Bay Area have to find somewhere else besides their home town to live. Furthermore, I ask where is it written that Mission natives have a divine right to the neighborhood and lifestyle that their parents and grandparents had? What do they think they are, West Virginia coal miners? As it is today, much of the Mission is a [mess], and an expensive one at that. I don’t understand how new market rate housing and improvements to the streetscape are bad things. Unlike most other products, increasing the supply, which isn’t to be confused with inventory, of housing typically increases prices/rents as newer homes tend to fetch higher prices, raising the neighborhood comps and demographics. At the same time, the increased density and demographics leads to more local services and investment, which further raises the relative desirability of the neighborhood. Or quite simply, the gentrification of a neighborhood tends to increase prices while the gentrification of a product typically has the opposite effect. Housing is not (nor should it be) a simple commodity subject to market whims. It performs many important community purposes which policy need meet. On a more anecdotal level, developers (who obviously want rents to increase), generally look at capital investment in the immediate vicinity as a positive, but they also look at a large pipeline of new housing in the market as a negative. Exactly the case Robert Rosania and Stellar managers prior Seth mallen and Bert Polacci know along with Arellano that the only issue is the predatory equity investment strategy, entitlements and the preservation of their money. The money for the land grab is probably funded by the prior entitlement sale at parkmerced… robbing peter to pay Paul and cashing out each time a site is entitled. BART and muni are stuffed to the gills in the area and public amenities suffer like pools libraries and parks due to over use (see Dolores) so maybe it makes better sense to have them rehab the Bart station vs the buying of new sites? Or a new public library? We don’t need more rat-stacks-pack housing we need housing with green space and better planned areas for the residents within. Anon’s point here is a good one – there must be some transition between the self-reinforcing gentrification dynamics that are obvious at a neighborhood level and the simplistic supply/demand equilibrium model (the latter is known as Arrow-Debreu to those who actually attended Econ 101 – the Wikipedia article discusses the model’s assumptions so you can see for yourself why you shouldn’t apply it to housing). The underlying issue is that the Bay Area is nowhere near economic equilibrium, but it’s crazier the closer you are to the peninsula. I think there are fast neighborhood gentrification effects due to walkability and racism, but they are driven by a more diffuse effect that is only limited by commute times. My anecdotal impression is that the fastest changing neighborhoods are the ones that have both amenities for the nouveau riche and a tolerable commute to the money factories down south. This is why when you produce more Maseratis, the price of my Honda goes up. Another great example of how the economics of housing differs from most other products. That’s the point you were cleverly trying to drive home, right? Actually it’s a great example of joe supply and demand drives the housing market, just like everything else. Maybe San Francisco’s history of limiting supply will keep prices low, though, and provide the counter example. How is it working so far? Actually, it’s not. You might want to read up on induced demand and how development moves a neighborhood’s demand curve. Then San Francisco should stop building all housing. That will freeze prices, right? Correlation is not proof of causation, but there is extensive global data showing a very strong correlation between an increase of high-end supply and an increase in the cost of all housing. On the other hand, is there any data showing a correlation between restriction of high-end supply and an increase in the cost of lower-end housing? Please share. All the shills have to stand on is the appeal to liberal guilt and the Econ for Kiddies S&D curve, which effectively models the price of widgets in ideally-competitive markets, but does a poor job modeling complex, non-fungible, sticky, info-asymmetric asset markets. But, we have to build more Maseratis to keep the cost of Hondas down, because, think of the chilllldren! I’d be interested to see the data linking an increase in high end supply with an increase in prices. I assume that all of these studies manage to correct for the effects of demand, right? 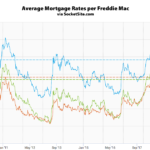 I believe that prices go up when demand increases faster than supply. They hypothesis is that prices go up when supply increases. If they have studies that show this, I’d like to see them. i actually misworded that. i meant as sarcasm that he actually does know economics. i wasnt being dismissive but you certainly are. in neighborhoods that are already wealthy like the mission, i would like to see some proof that increased supply increases prices. Hopefully you covered Latin, ‘cuz understanding ‘ceteris paribus’ is essential to applying most economic theories (even if it’s seldom possible in reality). I’m more confused/amused/raising-my-brow over the statement that “supply… isn’t to be confused with inventory”: oh, sure, I don’t doubt that the Editor(s) had in mind precise definitions of each term – out of the dozens that are possible – but it strikes me as a dubious practice to build one’s arguments on singular semantics and ignore popular usage. “I know zero about the economics of housing,”….you don’t say! Another factor In addition to the upward price pressures of gentrification as the editor described: housing functions as an asset. There is an strong inverse relationship between interest rates and asset prices. Extended periods of low interest rates seem invariably to lead to asset bubbles, as speculators seek ever-higher returns. IOW, you can’t build your way out of an asset bubble. Bubbles end when the monetary conditions that led to the bubble subside, resources limit further speculation, and/or there is no greater fool left standing. Econ 1 neo-classical economics pedagogy has done incalculable damage. Every joker who has taken Intro to Econ and learned simplistic, rarely-applicable, and unproven a priori theories is an instant expert on complex markets like housing, because, hey! all markets are the same, and it’s all just common sense! If any reader not a RE shill wants to learn why asset bubbles end in tears, you are advised to burn your Econ 1 texts and look into Hyman Minsky. There’s no such thing as a bubble in rental housing prices though… Those aren’t assets. No one is speculating. Right. Rents occur in a complete vacuum, there are no knock-on effects, and they are completely unaffected by nearby housing prices. And landlords who buy high-priced rental properties are in no way incentivized to ask top dollar. And there is no such thing as collusion. Nor are rents affected by extremely low interest rates that spur creation of profitless (but deeply-funded) unicorns and stock buyback-bloated P/E ratios. Someone’s got to build those pizza delivery aps, dammit! Nope, no bubble here! Which landlords are not incentivized to seek out as much rent as they can get? Seriously, not all landlords are sociopaths. Seriously, we have different definitions of “sociopath”. Smallholder landlords in owner-occupied buildings, are much more likely to consider lifestyle and self-image effects when writing leases. Back when he rented, some of my spouse’s landlords were soft on asking rent and increases because they found renting to a low-hassle musician to be more pleasant than the on-the-table money they gave up. The speculation on why the supply of smallholder landlords in SF has shriveled up I’ll leave to others. BMR by and large subsidizes housing for a certain segment of the population whose services the City desperately needs, i.e., muni workers, teachers, nurses, firefighters, police, handymen, mechanics, etc., but whom the city can’t pay salaries that permit them to live in the city. That’s not to say that all of those workers will necessarily choose to live in the city, but a certain percentage will thanks to BMR housing, and that reduces the market salaries for those workers. For example, a teacher who lives in the East Bay and has to commute in for his job is unlikely to keep up that pace of life for very long. The commute would easily add 2.5 hours to his day. This causes turnover, leading to poorer outcomes and more recruiting expenses. Moreover, a frustrating commute is unlikely to help mood and outcomes in the classroom. That’s not to say that a teacher will spend his entire career in the city because of subsidized housing, but a teacher will likely stay longer. So you’re right that it does nothing for the overall housing shortage. It’s not trying to solve the underlying problem. It’s trying to put a bandaid on the problem. But you have to continue to put a bandaid on the problem until the problem is actually solved. And given the red tape, height restrictions, and lack of infrastructure spending in SF, California, and the Country as a whole, the problem is unlikely to be solved. It doesn’t help the shortage at all. BMR rules are too restrictive for people to purchase — usually people who cheat the sfmoh system are the ones that can buy. Even if a legit buyer did qualify, they can’t make the HOA dues — usually over 500/mo. Cut fees and taxes, accelerate the planning process, and allow more housing to be built. Until then, buy and hold some middle-market priced SFRs or post-1976 condos and hold, sell, repeat for an easy 7-15%. The price of my 615 ft², one-bedroom, one-bathroom, 10th-floor condo was $268,000…It’s appraised at $640,000, though listings for nearby one-bedrooms can approach $1 million. Over the course of a year, my mortgage and HOA fees will be some $23,000 less than I’d pay to rent a similar apartment in the same area. If you’re a landlord or flipper and want more desperate workers to be your future victims, just say that, okay? Because everybody that is just trying to live their lives and not have the life sucked out of them by you and the people you play golf with know that if the city cut fees and taxes to zero, streamlined the planning process and allowed more housing to be built, buying property would still be unaffordable to the vast majority of San Franciscans, but “playing the real estate game” would be more profitable for folks like you. It’s nice to come out ahead. But it’s not so nice to use the non consensual power of government, which is inequitably distributed to do so. That being one of the exclusive few, who benefits from the gift of valuable discount real estate, that is not available fairly to everyone else. Why do you deserve such special unearned privileges ? That’s a somewhat reasonable case for BMR – but it seems really weird to go through all this extra trouble with all the overhead of administering a housing program, etc when it is also possible to just pay those damn workers what they need to meet market rents/mortgages. Even private school teachers should get a subsidy too. Instead BMR is just a random windfall and it may go to people who cheat or who otherwise aren’t the workers you’re describing that the City is really trying to help. The people who get these below-market units have to go through an application and qualification process that is actually more rigorous than what regular private mortgage buyers go through. They are vetted for meeting the income requirements. Saying “it is also possible to just pay those…workers what they need to meet market rents/mortgages” is magical thinking; the employers of these people don’t agree with you that it’s possible and that’s why they don’t do it. We had decades of real-world evidence that “the market” won’t pay such wages to certain classes of workers, that’s why the BMR program was created. I’m hoping as many people possible show up to support this project tonight. God knows there will be an entire contingent of people who’d rather have a disgusting Walgreens and concrete plaza than anything else. Oh, and for those who demand 100% affordable housing, where were they when the 100% affordable housing project got knocked down by the Telegraph Hill people because it didn’t fit the character of the hood? San Francisco NIMBY’s are insane at the bottom and the top of the income scale. Any updates on how the meeting went?